One of the most poignant moments at Camp Doughboy this past weekend was the rededication of the Merle Hay monument on Sunday morning. The color guard you see here are active service personnel currently serving in the First Division’s 16th Infantry Regiment. They had come from Fort Riley in Kansas and are the same men who had been in Paris this past July for the ceremonies there. The men in uniform behind them are living historians who had set up camp on the island for the weekend. I snapped the image of the new tablet a few minutes after the unveiling. I thought I would re-up the video we produced a few summers ago about Private Merle B. Hay. It is so good to see that the Hay tablet is back where it belongs. World War II in Europe was reaching its climax in late winter 1945. This past summer when I was at Hyde Park I had a conversation with one of the rangers in which we discussed that 2017 was the 135th anniversary of Franklin Delano Roosevelt’s birth. He was born there at Springwood on 30 January 1882. I usually visit Hyde Park every summer and have spoken to different rangers in recent years about the dwindling number of visitors who have that emotional, visceral attachment to FDR when visiting the site. It is no wonder, with so many Americans having grown up hearing the four-term president on the radio regularly throughout the Depression and Second World War. Nowadays there are still a few such on the pilgrimage, but for the most part that cohort has aged out. I find this photograph intriguing on a number of levels. The image is of Sergeant George A. Kaufman of the 9th Army and was taken in Germany on 9 March 1945. The public did not know it at the time, but Roosevelt was failing quickly by this time. He would die in Warm Springs just over a month later. Roosevelt’s life and times spanned much of the American moment, an era that sadly might be winding down before our eyes seven decades after his passing. Roosevelt attended Harvard at the turn of the century, served as Wilson’s Assistant Navy Secretary during the Great War, governed New York State in the late 1920s and 1930s, and was in the White House the last dozen years of his life. It is easy to forget that he was only sixty-three when he died. I see on the Hyde Park/NPS website that they are having a program today at 3:00 pm in the rose garden behind the library. The Hudson Valley is cold this time of year, but it looks like the weather will cooperate. I am curious to see if there is more to come over the course of the year. I’m sorry about the lack of posts in recent weeks but with the semester in full swing it has been a grinding period at work. I’ll have more posts in the coming days and weeks. Last Saturday I was in Oyster Bay for the Theodore Roosevelt Association conference. It was great seeing some folks again and meeting new people as well. The talks were great. After lunch I took a cab to Sagamore Hill with a couple from Texas who I had met that very morning. The three of us had split an earlier cab getting from the Glen Cove train station to the conference hall. I had never been to Sagamore before. It was rewarding to share the experience with others who have a strong knowledge of the topic. Because there is so much to see–I am fully aware that I missed a great deal in just our 2-3 hour jaunt–I’ll probably go back during a warmer weekend this winter. Yesterday I finished Hissing Cousins: The Lifelong Rivalry of Eleanor Roosevelt and Alice Roosevelt Longworth. I don’t know untold the story was, but the authors did a fine job of conveying the complicated relationship between the two women who between them lived in the White House for twenty years. I saw the co-authors (and married couple) speak at the Roosevelt House on East 65th Street a few years ago and spoke briefly to one of them. One thing the Ken Burns’s Roosevelt documentary did well was show how the two sides of the family interconnect in all its human complexity. The authors of this dual Alice and Eleanor biography have done the same. This weekend I began James MacGregor Burns’s Roosevelt: The Lion and the Fox. The book came out a full sixty years ago, in 1956,and straddles a line between history and current events. It is volume one of an eventual two volume work and ends in 1940 on the cusp of the Second World War. Volume two came out out in 1970. I’m reading it with the awareness and caveat that James Burns was an open admirer of FDR. As a cog in the political/academic nexus of the 1940s-60s though, I suppose this was inevitable. My impression however is that Burns did not lapse into the role of court historian the way Arthur Schlesinger Jr. did. The Lion and the Fox is a political biography and I am looking forward to hearing what Burns has to say about young Roosevelt as assistant navy secretary during WW1. We are getting the front end of the Hurricane Matthew rainfall here in New York City. It makes for a relaxing Sunday, especially when I don’t have to leave the house at 7:30 to go to Governors Island. I was out-and-about yesterday running some errands in the city when I came across this window display in the Oxford University Press office on 35th and Madison. A quick perusal shows that OUP has created a small online site dedicated to the NPS’s 100th. Most passersby certainly walk past this with a sense of incongruity, not realizing that there are at least a dozen Park Service sites in and around Greater New York City. I always found it curious that Woodrow Wilson created the Park Service in August 1916, what with the presidential election in full swing and Europe mired in the death and destruction of the Great War. Just how important he believe the Park system to be is something I suppose we will never truly know. It is a flawed institution in many ways, for reasons mainly outside of its own control, but our national parks are still, as the saying goes, one of our best ideas. We were up and out early this morning to attend an event at the Manassas battlefield. When we got there at 7:45 there was only one other person there, a gentleman from Texas who was playing Pokemon Go on his phone sitting on the porch at the Henry Hill house. He and I had a good conversation for about twenty minutes between ourselves while the Hayfoot stayed back at the visitors center. It was so nice being there early before people began showing up to mark the anniversary of the first battle. I could feel he dew scrunching under my feet as I walked along. The rangers and volunteers told me that most of the events are to be held this coming weekend. These images are all from today. Incredibly I first posted this five years ago today. I remember being in DC, though not Manassas, that Thursday in 2011. The heat index was in the 120s but they still managed to get a sizable crowd for the 150th anniversary of First Bull Run. We were following it online. The sesquicentennial itself. is already receding into memory. I am writing this from Washington, DC. 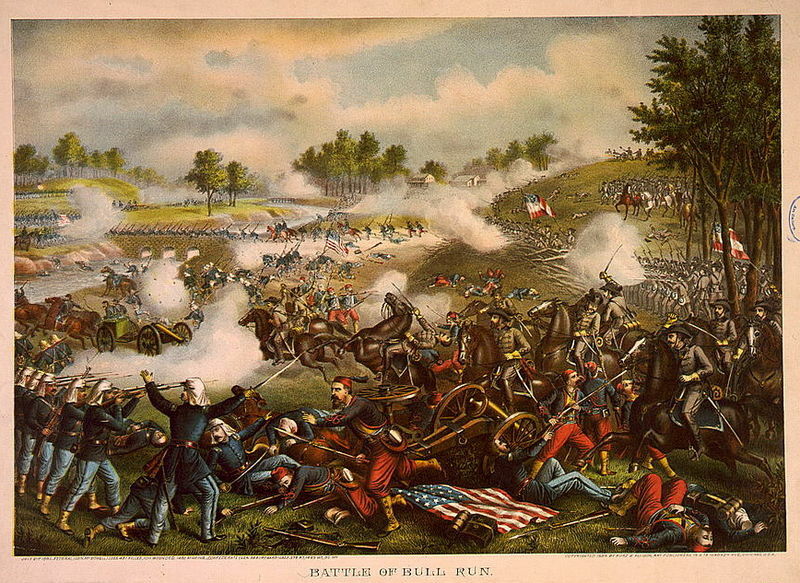 Today marks the 150th anniversary of the First Battle of Bull Run, which took place only about thirty miles down the road. It was not until I began visiting DC regularly a few years ago that I realized just how close to the capital the Civil War occurred. Fifty years ago today New York State made some history of its own when it donated one hundred and twenty six acres of Virginia countryside to the federal government. In 1905 and 1906 the New State legislature authorized the purchase of six acres of land for the construction of monuments for the 14th Brooklyn (later renamed the 84th New York), the 5th New York (Duryee’s Zouaves), and the 10th New York (National Zouaves). Each regiment was granted $1,500, which was the standard rate for such projects at the time. (The monuments for the latter two regiments were in recognition of those units’ actions during Second Bull Run.) The three monuments were dedicated together on October 20, 1906, with scores of veterans taking the train from New York City and elsewhere in a pounding rain. Fast forward to the early 1950s, when New York State officials prepared to give the six acres to the Manassas National Battlefield Park. 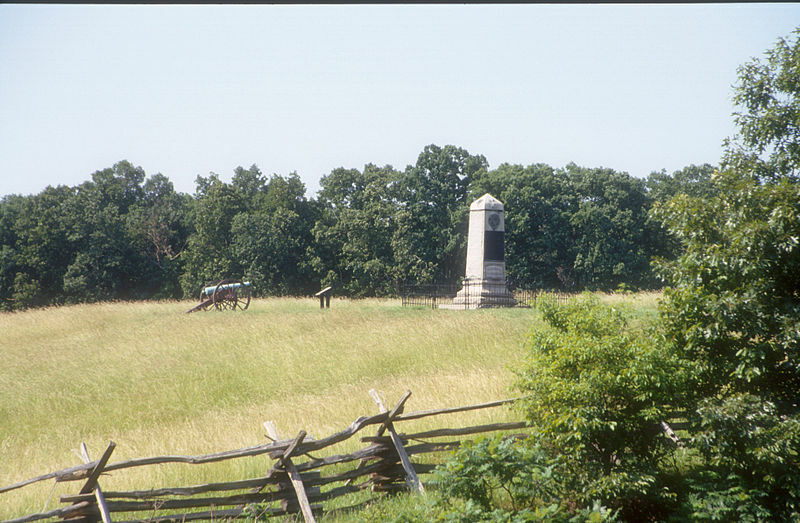 The deal became complicated, however, when the legislative Committee to Study Historical Sites realized that encroaching development threatened to cut the three monuments off from the rest of the battlefield. Chairman L. Judson Morhouse advised the state to buy an additional one hundred and twenty acres to ensure that the Empire State’s units would fall within the parkland. The state agreed and purchased the acreage in 1952. Later in the decade the New York State Civil War Centennial Commission, Bruce Catton Chairman, proposed to transfer the land to the Park Service during the 100th anniversary of First Manassas in 1961. Not surprisingly, the NPS was amenable to this and so fifty years today Brigadier General Charles G. Stevenson, Adjutant General of New York, handed over the deed to Manassas superintendent Francis F. Wilshin. 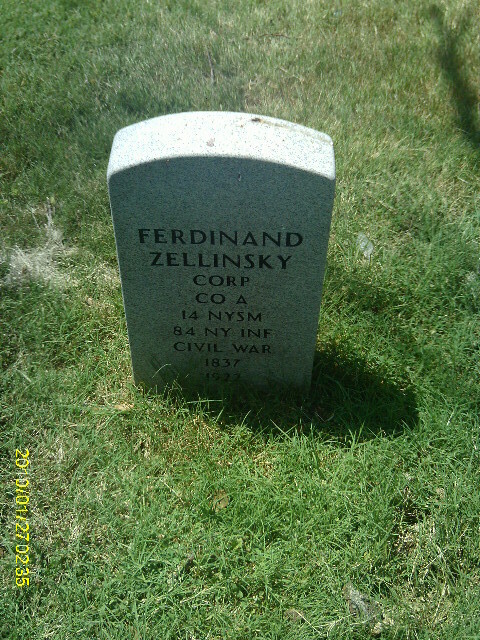 German-born Corporal Ferdinand Zellinsky of the 14th now rests in Brooklyn’s Green-Wood Cemetery.